April 2017 - Notes from D.J. clothed with a long robe and with a golden sash across his chest. His head and his hair were white as white wool, white as snow; his eyes were like a flame of fire, his feet were like burnished bronze, refined as in a furnace, and his voice was like the sound of many waters. In his right hand he held seven stars, and from his mouth came a sharp, two-edged sword, and his face was like the sun shining with full force (1:13-16). his name is called The Word of God… From his mouth comes a sharp sword with which to strike down the nations, and he will rule them with a rod of iron; he will tread the wine press of the fury of the wrath of God the Almighty (19:13-14). It’s noteworthy, however, that the word ποιμανεῖ, translated as the verb “to rule,” is more appropriately translated “to shepherd;” the same root appears in Jesus’ command to Peter in John 21:16: “Shepherd (or feed) my sheep.” Despite the warlike images Revelation offers, Jesus’ “war” is conducted with Truth, not steel, and his goal is to care for, not conquer. If this seems ironic, presumably it is meant to be; like the Gospel of John, Revelation contains a great deal of irony. “Then I looked, and there was a white cloud, and seated on the cloud was one like the Son of Man, with a golden crown on his head, and a sharp sickle in his hand!” (14:14). Here, Christ the majestic becomes the reaper of the earth. The text does not say exactly what was reaped. In the following passages, angels reap grapes and make wine (14:17-20). The second appearance of Jesus is in Chapter 5. Here we find more irony, as the elder tells John that only “the Lion of Judah, the root of Davis” can open the scroll. But what John sees is not a lion, but lamb “standing as if slaughtered” (5:6). It is not Jesus’ power and glory but his sacrificial death on the Cross that makes him worthy to open the scroll. As the seals are broken and the story unfolds, we are told more about the Lamb. Washing robes in his blood makes them white (7:14), he will shepherd (the same verb ποιμανεῖ is used as in 19:14) to the water of life (7:17, cf John 4:10, 10:11), he keeps the book of life (13:8, 21:27), and he is “Lord of lords and King of kings” (17:14). The “great multitude” (7:9) has been saved, we are told, because “they have washed their robes and made the white in the blood of the lamb” (7:14, cf 1 John 1:7). It is not only belief in the Lamb that saves, but participation in his blood sacrifice. “They will hunger no more and thirst no more” (7:16, cf John 6:35, Isaiah 49:10). We should note here that despite the plagues being unleashed on the people of earth (which I’ll discuss in another post), what believers are called to do is to remain firm in their faith, even in the face of persecution. There is no allowance here for violence. In no way do the followers of Jesus participate in God’s judgment. They are called instead to a radically nonviolent response in the face of gathering armies and falling empires. In Chapter 12, we see the third representation of Jesus: the innocent infant. He is described as ““a son, a male child, who is to rule all the nations with a rod of iron. But her child was snatched away and taken to God and to his throne…” (12:5). (Note the use of the word ποιμαίνειν, another form of the verb “to shepherd”.) Here, in the midst of God’s Kingdom being declared, we encounter the birth of Jesus, the hope for the future. In Part 1, I argued that John intends to place these events outside our concept of time, a topic I’ll return to again; this is surely more evidence of that intent. I, John, am the one who heard and saw these things. And when I heard and saw them, I fell down to worship at the feet of the angel who showed them to me; but he said to me, “You must not do that! I am a fellow servant with you and your comrades the prophets, and with those who keep the words of this book. Worship God!” (22:8-9). “It is I, Jesus, who sent my angel to you with this testimony for the churches. I am the root and the descendant of David, the bright morning star” (22:16). As we read Revelation, we find a great deal of ambiguity between Jesus and God, as we do also in the Gospel of John (e.g. John 14:7, 14:10-11). In this particular verse, we find ambiguity between Jesus and his servants, suggesting that just as there can be oneness between Jesus and God, there can also be oneness between Jesus and those who serve him (note the language in 22:9: “I am a fellow servant”). Again, this echoes the Gospel of John: “Abide in me as I abide in you” (e.g. John 15:4a). Books could be written about Jesus as he appears in Revelation (and they have been). However, this short summary of the three (or four) representations of Jesus do give us an overall feel for where Revelation is taking us. Jesus is the Savior, and Jesus is the Word. Yet despite the warlike language describing him, Jesus does not fight his battles with military force. Instead Jesus conquers through Truth and through his own sacrifice on the Cross– a ritual execution by a conquering power that, to readers of the 1st century, was conventionally associated with defeat. I woke up at 2:00 this morning thinking about analogies. My brain is funny that way. Specifically, I thought about the relationship between science and religion. To him, science is real and religion is made up. Yet fiction does capture and express important ideas. Why else do we still enjoy Shakespeare? And even today, who can read The Grapes of Wrath and not be moved? With a nod to my friend, fiction can also promote negative ideas. Consider, for example, the global impact of certain people’s interpretation of Atlas Shrugged! And yet there’s more to it than that. Science provides facts, but not morality. When it does provide morality, it is frequently unpalatable–utilitarianism and Social Darwinism, for example. The latter argues that if the point of existence is survival of the species, then only the strongest should survive, a view used to justify the Holocaust and other crimes against humanity. The former argues that humans are inherently replaceable, one is the same as another, and are thus disposable. One Australian ethicist argues not only that abortion should be legal throughout pregnancy, but that children should be allowed to be killed even after birth! It seems to me that science is a better source for facts than it is for morality. This still doesn’t capture the full picture, however. Science measures what exists as matter and energy in the physical (corporeal) world, and theorizes based on that and only that. It does tell a story, though that story is based in a conservatively historical perspective: events happened in this order, with no apparent underlying theme. Nutrition gives you everything you need to survive. I’ve been told if I ate bran muffins, beans, and kale, I could live forever. Or maybe it would just seem like forever. What would life be without fried chicken, cheese, and strawberry pie? (Or bengan bharta, tom kha kai, and papusas?) They may not be biologically necessary, but life is pretty dismal without them. Cuisine gives us comfort and identity. It gives us a place to gather and pause together. It brings joy and hope to a landscape littered with bran muffin wrappers and empty water bottles. For me, this highlights the primary shortcoming of science in the absence of religion: it lacks humanity. Don’t get me wrong, I don’t believe the universe was created for my own needs and desires. Let me put it another way: science explains the creation of the Helix nebula and allows us to see it. But it’s not science that causes us to perceive it as beautiful. This cartoon was inspired by the ongoing conversation between Mennonites and Charismatics…. The synoptic Gospels (Mark, Matthew, and Luke) portray Jesus’ ministry as an inexorable journey of Jesus to Jerusalem where he enters the city in triumph on Palm Sunday. “Hosanna!” the people shout. Their king, the Messiah, has arrived, bringing with him great expectations. Yet, as we know, actual events were not what the people expected. Jesus did not take the throne, nor did he inaugurate a new political structure based in justice and peace. Instead, he was arrested and executed as a common criminal. We can only imagine the disappointment of his followers on Good Friday. Not only were their expectations disappointed, but the man they looked to (yes, they saw him as a human being) died in disgrace. Their hopes for their future and their confidence in this man both lay in tatters before the Cross. Palm Sunday is thus a day of hope, and yet also a day of impending despair. Through its lens, our hopes for the imminent Kingdom appear to be misplaced. And yet, to this story of temporal disappointment, John adds an important perspective that offers hope. The Gospel of John is clearly different from the other three. He focuses not on Jesus’ temporal ministry, but on the spiritual nature of that ministry. Instead of a birth narrative, he tells us, “In the beginning was the Word, and the Word was with God, and the Word was God” (John 1:1). He emphasizes the eternal presence of Jesus. In the very next chapter, Chapter 2, John tells us that “Jesus went up to Jerusalem” where he cleansed the temple (John 2:14ff). Yet it is not until Chapter 12 that Jesus enters Jerusalem as King (John 12:12ff). Clearly this diverges from the accounts of the synoptic Gospels. But if we concern ourselves with the historical issue of chronology (Did Jesus go to Jerusalem before Palm Sunday or not? ), we miss the point. John is telling us something deeper than names, dates, and historical facts: Though we as humans perceive Jesus’ ministry as linear, though we perceive his entry into Jerusalem as a triumphal and climactic event, he was already there, just as he was already among us before his birth. But we couldn’t recognize him. Why does this matter? Because it says something important about the Kingdom of God as well. The synoptic Gospels portray Jesus preaching that “the Kingdom of God has come near” (e.g. Mark 1:15). Other translations use the words “at hand” or “nigh.” The implication is that the Kingdom is imminent. We can reach out and touch it. And yet we can’t see it. Clearly the Kingdom is not the driving force in this broken world of ours. Paul expected the Kingdom to be established before his death (e.g. 1 Thess 4:15). And people have been waiting expectantly for it for two millennia. For John, Jesus is the King, and belief in Jesus brings us into the Kingdom. Yet there is an expectation that being in the Kingdom will motivate and empower us to do the works that Jesus did. He leaves it for the synoptic Gospels to describe those works in detail. The point is, in a very real sense, for John, the Kingdom is now. We, the readers, are human. 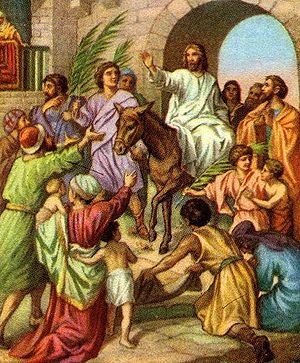 We cheer as Jesus enters Jerusalem, waving our palm fronds, anticipating the inauguration of the Kingdom. Our hopes are dashed on Good Friday, and renewed on Easter. We look forward to that day in the future when the Kingdom is fulfilled. And yet, like Jesus himself, it is already here. Who Wrote the Laws of Physics? This post is for a friend of mine who is an atheist, who believes in science, and who is currently suffering. He is resistant to the idea of God. My purpose in writing is to suggest some thoughts that may encourage speculation beyond science. Let me be clear: I believe in science. I accept that evolution is real, since the scientific evidence seems to suggest it. I find anti-evolutionist arguments occasionally thought provoking, but rarely convincing. On the other hand, I don’t believe that science is the last word. It explains our physical world–for the most part. It surely has gaps in it that may or may not be filled some day. But it fails to explain why some of the amazing aspects of creation came into being. And it fails to explain anything beyond the physical world. Let me start with an example: how is it that the material on which life depends is “coincidentally” the only material I am aware of that has the property of being lighter as a solid than as a liquid at temperatures that support life (as we know it). That material is, of course, water, and this property allows complex ecosystems to survive in temperatures at which water freezes. If it didn’t do this, lakes would freeze from the bottom up, killing much of what lived in their waters. A partial list of other materials with this property are silicon, gallium, germanium, bismuth, plutonium, and sand, which do not in any way lend this property to the support of life as we know it. How do we explain people who can read another person’s thoughts, and those who sometimes know the future? Science itself admits that it can’t explain some of what it sees. A team once did a long-term study of nuns in an attempt to discover why they didn’t get Alzheimer’s Disease with the same frequency as the general population. Over the course of many years, they discovered (through autopsies) that the nuns did in fact get Alzheimer’s with the same frequency, or at least their brains showed the physical effects of deterioration. Yet they didn’t manifest symptoms. The only explanation they could find was the effect of constant prayer, which of course they could neither define nor measure in a scientific way. Although the very consideration of such a possibility may appear scientifically bizarre, it cannot be denied that, across the planet, people pray for health and for relief of symptoms in times of sickness. Healing through prayer, healing through religious rituals, healing at places of pilgrimage and healing through related forms of intervention are well-established traditions in many religions. Lesniak found that the prayer group animals had a greater reduction in wound size and a greater improvement in hematological parameters than the control animals. This study is important because it was conducted in a nonhuman species; therefore, the likelihood of a placebo effect was removed. The authors raise some important issues on the study of prayer within scientific context, some of which have a theological nature (i.e. does it matter which God is prayed to; does God have limitations?). They conclude that a satisfactory scientific study is virtually impossible because of the variety of religions, assumptions, and theological questions. Nevertheless, they do not discount the idea that prayer is beneficial. And how do we explain noncorporeal entities? In my own life, I’ve encountered two ghosts, dozens of earth spirits (I call them fairies), and innumerable dark spirits that I refer to as demons. My wife tells of encountering a skinwalker. At present, there is no means in science to explain (or even study) these, because so far as I know there is no way to empirically measure them. And yet my experience, even as an infant when I didn’t yet know what such things were, is that they exist. It seems to me that we exist in a physical world, and yet not only in a physical world. We potentially have access to a realm beyond the physical which is as yet immeasurable through physical science. Yet our post-enlightenment culture discourages us from taking seriously anything that can’t be explained through science and logic. Is that logical? There are enough experiences and enough questions to suggest that it isn’t. By no means do we need to discard science. We don’t discard accounting just because it fails to address the issues of humanity, and neither do most of us suggest that such issues don’t exist because accounting can’t address them. We don’t discard music or art just because they fail to explain science, nor do we deny science on that basis. And we shouldn’t discard our search for knowledge of the physical world. But neither should we presume that the physical world is all we have just because that’s all science can explain.